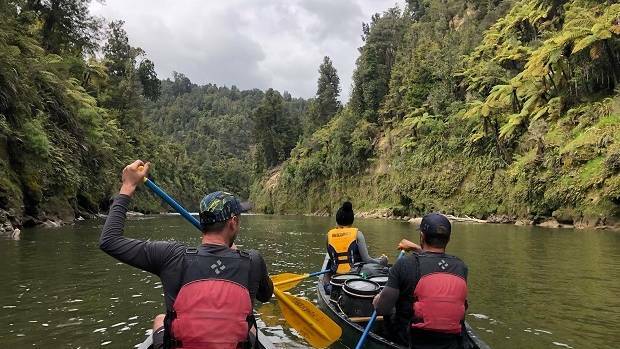 Phil Williams and friends paddle the Whanganui River and find more than they expected. Kiwis spend long weekends in many ways . . . building a deck, at the bach or in the great outdoors. 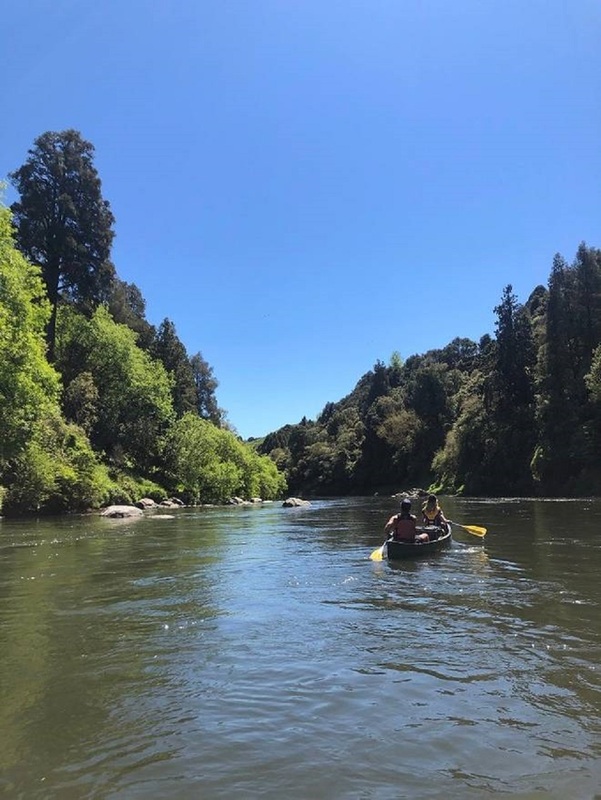 Our group of friends is busy ticking off the Great Walks, so we decided to explore one of New Zealand’s most important bodies of water, Te Awa o Whanganui (The Whanganui River). As proud New Zealanders, we have powerful bonds to our people, land and water. We’d discover this river connects us all in ways we hadn’t known. The Whanganui begins in the centre of the North Island and winds for more than 290km, before meeting the Tasman Sea at Whanganui. It holds a significant place in our history, having served as a major trade route for timber, wool and produce. Goods would come upriver to major landings, then proceed by horse and cart to inland settlements. This mighty watercourse filtered people, trade and wealth through once-impenetrable forest land. Te Awa o Whanganui holds spiritual meaning to Māori. A number of tribes lived along its shores. Today, many of the pā sites have gone, but several remain, infusing the journey with a rich heritage born of its original inhabitants. Most travellers canoe for three days, but The Whanganui Journey proper is five, and starts from Taumarunui. We’ve stayed with family and friends in Ōhakune, 45 minutes south, so it’s an early start. But the day dawns clear, and bleary eyes are rewarded with a sunrise on Mt Tongariro. We grab the espressos and head to the river. You can paddle the Whanganui with your own gear, but there’s a humming local economy for boats of all kinds. We’re with Taumaranui Canoe Hire. Its team is briefing the day’s travellers. We’re mostly newbies to river trips, so safety obligations are taken seriously. Our teacher describes how to lean if we end up sideways to a rock . . . and warns that our canoe can end up wrapped around it, if we don’t. Down at the water lie our Canadian canoes. We’re two to a vessel, dry gear stowed in sealed drums provided and the canoes are big enough to travel with luxury items like a portable brazier, fishing rods, and a feast of good food. Ultralight backpacking this is not. Balance is important however, and a day’s paddling on a lean means a night with an aching neck, so we learn to take our time to float and level the boats. The journey begins with easy paddling under blue skies. 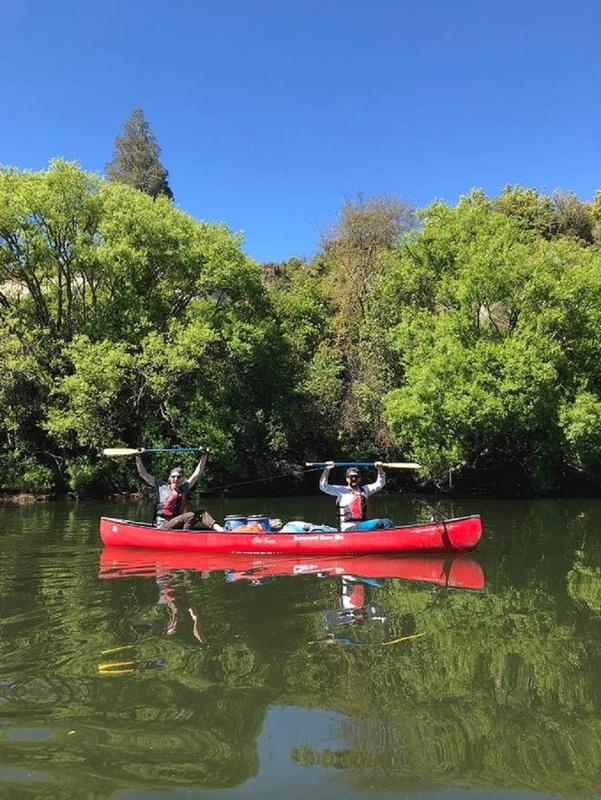 It takes a little time to get used to paddling with a partner, the one-sided action is very different to kayaking. Picture-perfect farmland peppered with big shade trees glides by, and there’s a shingle beach every few bends, should we need a stop. And stop we did. With time on our side, we made the most of the day and stopped for photos, to break open our sugar-rich snacks and to try our hand at fly fishing. The first rapids are daunting. Hearts pounding, we trust our teachings and aim for the V of foam, avoiding the rocks. We’re wet, and bailing water splashed over our bows, but we’re all floating. As the journey progresses our confidence builds, and the rapids are exhilarating. On day two we start late. Time worries are heightened by our poor map-reading skills. We can’t work out where we are and the map names don’t match the signs on the riverbanks. Anxiety stretches out our time between breaks. We dig the water and grumble off sore shoulders. To take our mind off the effort, we invent a game of spotting goats. The little critters are on both riverbanks throughout the paddle. We scan the cliffs and bush line, building points and vying for the title, until Whakahoro Campground emerges. But our excitement is short-lived. The campground is 300m up a steep gravel road. We grit our teeth and lug the barrels. Our reward is a serene rural campground by a horse ranch. There’s a golden sunset, then lamb racks on the brazier. We sleep like the dead. The next two days push us deep into the heart of Whanganui National park. Over us tower steep cliffs, piled with lush ferns, wild flowers, and tall grasses so green they glow. It’s an untouched paradise. The current slows to a lazy pulse. We bind the canoes alongside each other to form a flotilla, and lie back. The sky spins overhead and New Zealand falcons soar. Drifting on, we spy an opening in the massive rock wall. A rushing stream and shafts of light call us in. We enter a lost world . . . a deep canyon, giant logs and boulders stacked high upon each other, light prisming through a roof of ferns. The green moss walls are crawling, full of life. The following evening’s stay is equally memorable. Tieke Kainga Campsite is a marae, and we’re given a warm welcome by our local hosts. We keep clear of the main marae until after dinner, when we’re invited to take part in the welcoming pōwhiri. Introductions are made by hosts and guests, each naming their family, their body of water and their mountain. Offerings are given and songs are sung. Our hosts while away the dusk light with us, sharing the stories behind the carved figures on their pouwhenua. The next day we’re on the home stretch. It’s hard to believe we’ve spent five days on this magical river. But first, our little fleet has some final rapids to tackle, a doubleheader, with big pressure waves passing close to rock walls. We storm the first, taking on floods of water but staying afloat. Bailers out, we press on. At the next rapids, we channel to the right. Our first canoe powers around the spray, the second tight behind. But the third has missed its line and ends up mid-channel, where the waves pile up against each other. Drifting sideways, they roll slowly in and under, barrels bobbing up to the surface. It’s all hands to the rescue. But our lifejackets are up to the task and in a couple of minutes it’s all over bar the laughing. There will be many keen Kiwi hikers who hadn’t considered doing the Whanganui Journey. Maybe because it’s not a hike, or they might not have the right gear, or thought it might be hard to paddle. Having completed it, we can say it’s very do-able, and worth every minute.